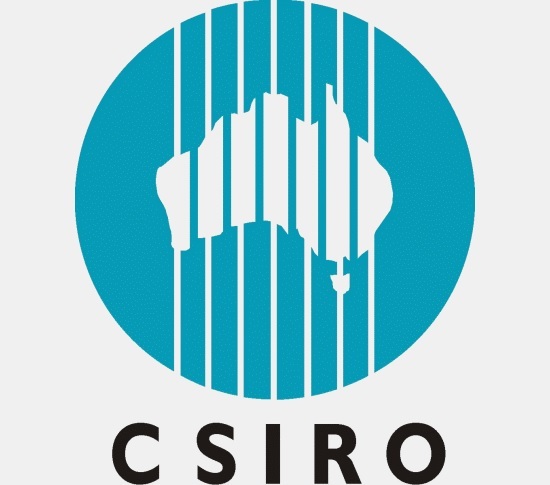 Curtin University (formerly known as Curtin University of Technology and Western Australian Institute of Technology) is an Australian public research university based in Bentley and Perth, Western Australia. The university is named after the 14th Prime Minister of Australia, John Curtin, and is the largest university in Western Australia, with over 58,000 students (as of 2016). Curtin was conferred university status after legislation was passed by the Parliament of Western Australia in 1986. Since then, the university has been expanding its presence and has campuses in Singapore, Malaysia, Dubai and Mauritius. It has ties with 90 exchange universities in 20 countries. The University comprises five main faculties with over 95 specialists centres. The University formerly had a Sydney campus between 2005 & 2016. On 17 September 2015, Curtin University Council made a decision to close its Sydney campus by early 2017. 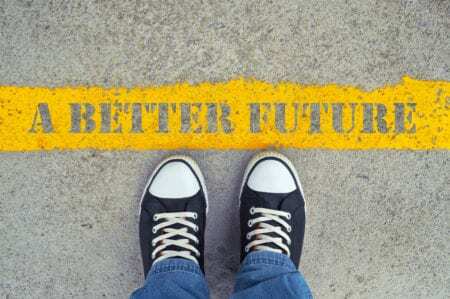 Researchers from Curtin University and the Telethon Kids Institute will explore the strengths and skills that can help build a better future for people living on the spectrum at this year’s Autism Open Day. Adults and children with autism, their families and the wider community are invited to attend the free annual event, which will include presentations from autistic adults and information on current research and programs aiming to support people with autism. Autism Open Day will mark the start of Curtin’s Research Rumble, a series of events that promote the innovative research projects being undertaken at Curtin University, from March 24 to 27. Curtin Autism Research Group (CARG) Director Professor Sonya Girdler, from the School of Occupational Therapy, Social Work and Speech Pathology at Curtin University, said only 42 per cent of Australian adults with autism participate in employment, compared to 53 per cent with other disabilities and 83 per cent without disabilities. “People with autism possess unique skills and qualities that include being punctual, having high attention to detail and a high tolerance for repetitive tasks, and these skills can be beneficial to many employers, especially in the technology and software development industries,” Professor Girdler said. “It is essential to prepare and mentor young adults with autism throughout their education to ensure they are ready to tackle the workforce. Employers can play an important role in supporting autistic people in work environments, making small changes to the workplace and tailoring job descriptions to match an autistic individual’s skill set and strengths. Professor Girdler explained that Autism Open Day offered a great opportunity for people with autism and their families to exchange knowledge and experiences in a safe environment. 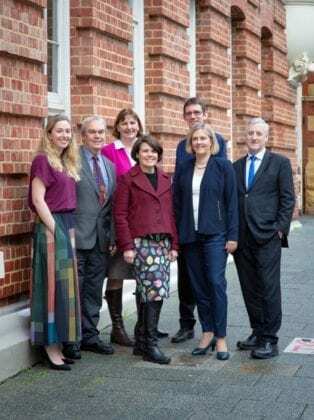 “Members of the public attending this year’s Autism Open Day will have access to a range of important information about pathway planning for school leavers with autism, quality of life tips for adults with autism, medication use amongst adults with autism, the transition to school, and peer-mentoring programs for university students with autism,” Professor Girdler said. Autism Open Day will be held in the Technology Park Function Centre, 2 Brodie Hall Drive, Bentley, on Sunday, 24 March, from 10am to 3pm. Further information can be found online here. Honours student Morgan Cox, from Curtin’s School of Earth and Planetary Sciences. 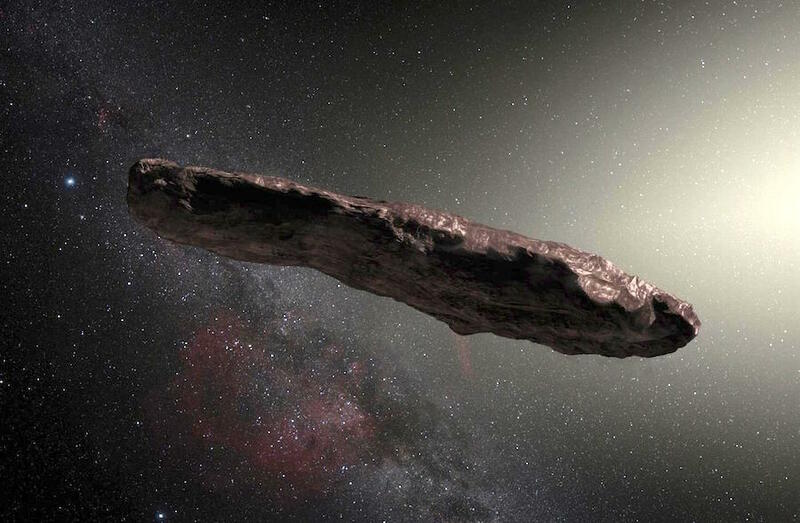 The unusual object – known as ‘Oumuamua – came from another solar system, prompting speculation it could be an alien spacecraft. This artist’s concept depicts ‘Oumuamua, which recently swung by the Sun during a quick pass through our solar system. Though initially believed to be a comet from another star system, further study revealed the object was actually an interstellar asteroid, which astronomers previously thought were much more rare. ESO/M. Kommesser. So astronomers went back through observations from the Murchison Widefield Array (MWA) telescope to check for radio transmissions coming from the object between the frequencies of 72 and 102MHz – similar to the frequency range in which FM radio is broadcast. “If advanced civilizations do exist elsewhere in our galaxy, we can speculate that they might develop the capability to launch spacecraft over interstellar distances and that these spacecraft may use radio waves to communicate. “So once the SKA is online, we’ll be able to look at large numbers of objects and partially balance out the low probability of a positive detection,” Professor Tingay said. 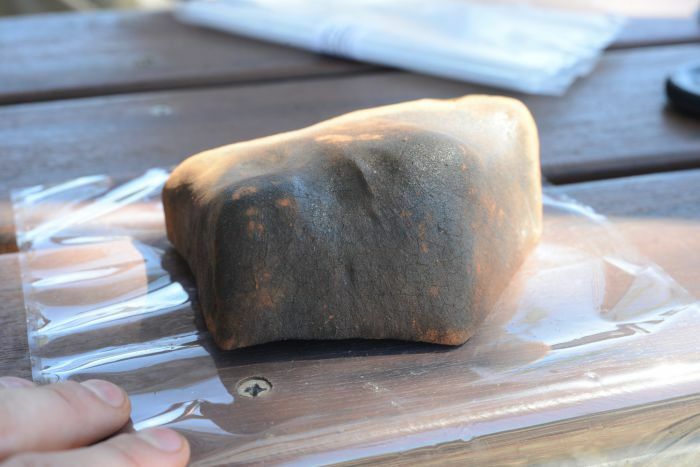 A meteorite estimated to be older than Earth has been recovered from a West Australian farm with the help of some enthusiastic stargazers and a phone app. 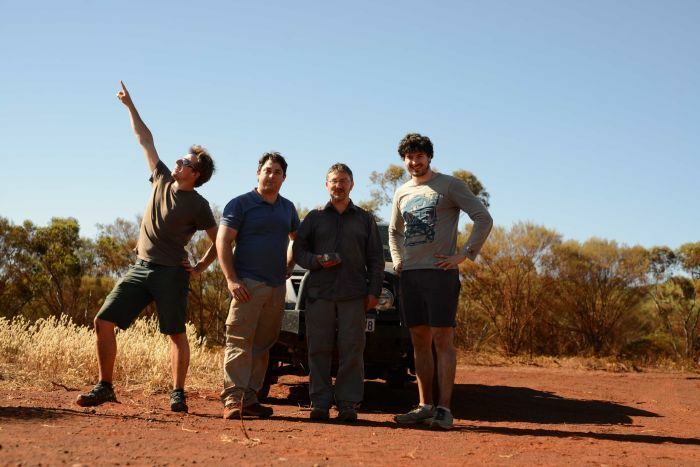 The 1.15-kilogram meteor landed near Morawa on Halloween, discovered days later by members of Curtin University’s Desert Fireball Network (DFN). DFN founder Phil Bland said the fireball was located with the help of four skyward-pointing outback cameras and reports made to the Fireballs in the Sky citizen science app. He said retrieving the meteorite so quickly meant it is in good condition and scientifically valuable. “Our team was able to track the fall line and calculate its landing spot to within 200 metres of where it was subsequently found,” Professor Bland said. “It [the meteorite] is a type called a chondrite, which is a type of meteorite which has not been cooked up enough to melt. “We’re hopeful, because we managed to get it in a very pristine way, that we can find some quite soluble elements or minerals in there, or volatile minerals that can tell us about water and organics in the solar system. Prof Bland said of the 50,000 meteorites that have been discovered, the origins of only 20 to 30 are known. Meteorites decelerate to a free-fall velocity by the time they hit the earth, travelling at the same speed as a rock thrown from a tall building. Before falling through the atmosphere, the meteorite is predicted to have been 50-100 times bigger than its current size. Martin Towner from the Department of Applied Geology described the rock as a pristine, unweathered and a fresh sample. He said there was no visible impact on the ground where it was found, about 300 kilometres north-east of Perth. DFN’s Ben Hartig said they were at the correct field when they first looked, but called it a day before they found the meteor. The next morning they looked in another paddock, before it was finally discovered in the original field. “It was right at the end of the field, so we pretty much all thought we’d finished off that field and we then we see this black rock,” Mr Hartig said. 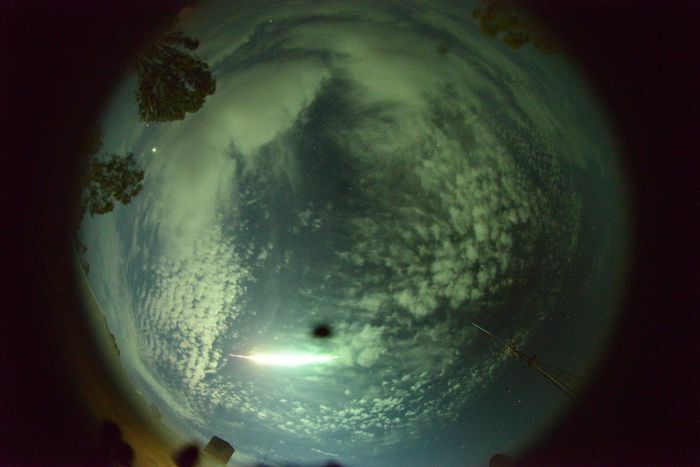 Founder of WA’s Stargazers Club, Carol Redford, was one of those who uploaded her location to the app when she saw the meteorite streak through the sky. “I immediately grabbed my smart phone and headed outside,” said Ms Redford, who is also known as Galaxy Girl.